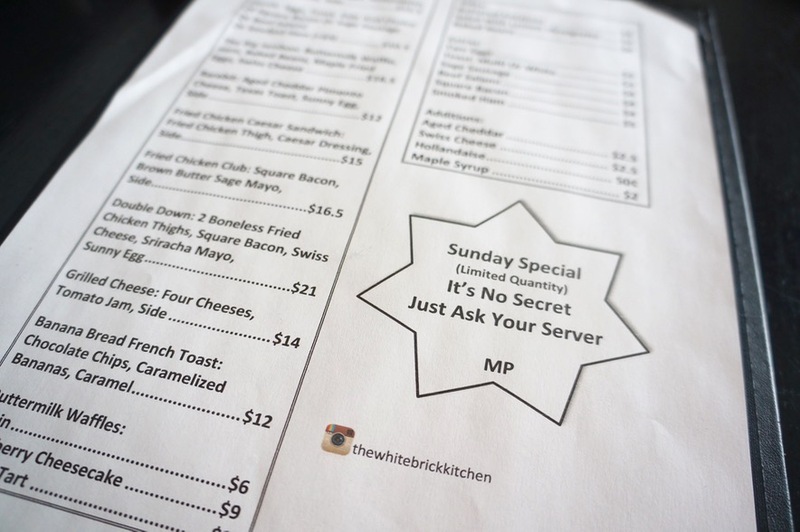 White Brick Kitchen is open from Tuesday to Saturday from 11:00am to 9:30pm and Sundays for brunch from 9:00am to 3:00pm. Reservations are accepted except for Saturday lunch and Sunday brunch. Mike and I dropped by for brunch at around 10:30am and the place was packed. Luckily a few tables were turning over and we only had to wait 15 minutes before getting seated. By the time we left, the line was out the door. Their food offerings lean towards the heavier side of things and include options like “The Big Jambon” (waffles, ham, beans, egg and cheese), rarebit (aged cheddar pimento cheese with Texas toast and a sunny egg) and a fried chicken sandwich. Price-wise, main dishes range from $12 to $21. 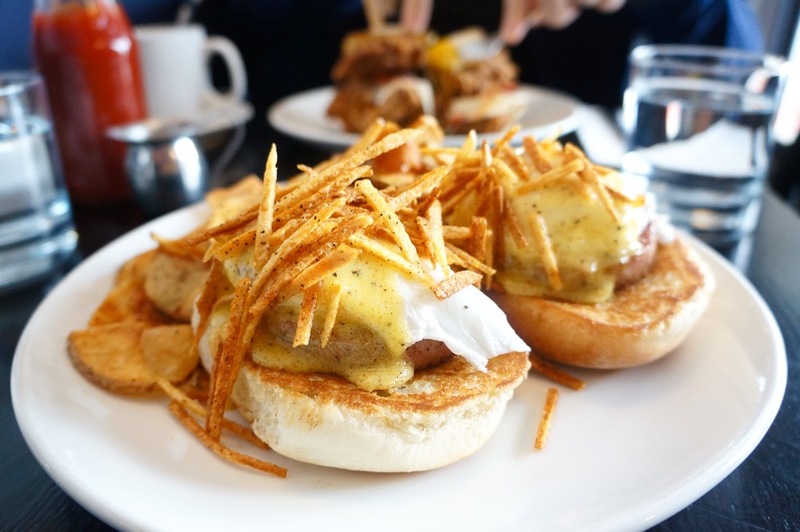 I decided to go with The Benny – Scotch bap, sage sausage, poached eggs, hollandaise, hickory sticks and choice of side ($12.50). All in all, this was a fantastic benny. I particularly enjoyed the Scotch bap (like a bread roll) – it had this nice chewiness to it and held up extremely well against the perfectly poached eggs and hollandaise. The hollandaise was delicious (although I wish there was a touch more of it) and the Hickory sticks added a nice salty crunch. 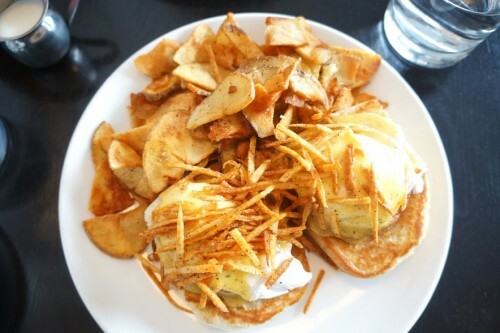 The benny came with a choice of side: buttered potatoes, salad or baked beans. I went with the Buttered Potatoes which turned out to be thin chips as opposed to chunks of potato. If you’re getting a side, definitely skip the salad and baked beans and go for these potatoes. They are ridiculously addictive. Despite being beyond full after the benny, I couldn’t stop picking at them. 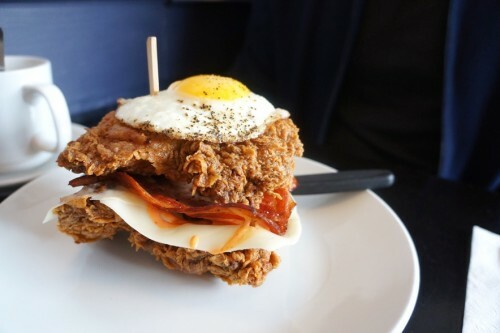 Mike went all out and ordered the Double Down – 2 boneless fried chicken thighs, square bacon, Swiss cheese, Sriracha mayo & a sunny egg ($21). The fried chicken itself was great – a nice crispy batter and juicy interior but I felt the whole concoction needed something saucy to pull it all together. It just felt like we were eating fried chicken with a few things tossed on it as opposed to one cohesive dish. Not bad but not memorable either. I wouldn’t order this again, especially given the steep price tag of $21 (the most expensive item on their brunch menu). 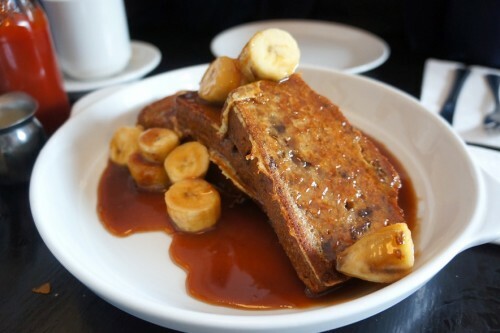 For dessert, we shared an order of the Banana Bread French Toast – chocolate chips, caramelized bananas & caramel ($12). One order comes with three thick slices. It’s a shame they don’t offer half orders of this. There was no way we were able to finish this after our mains. I loved the caramelized bananas and the caramel sauce made it just that much more decadent. Good luck trying to tackle this one on your own. It’s definitely a sharing kinda dish. 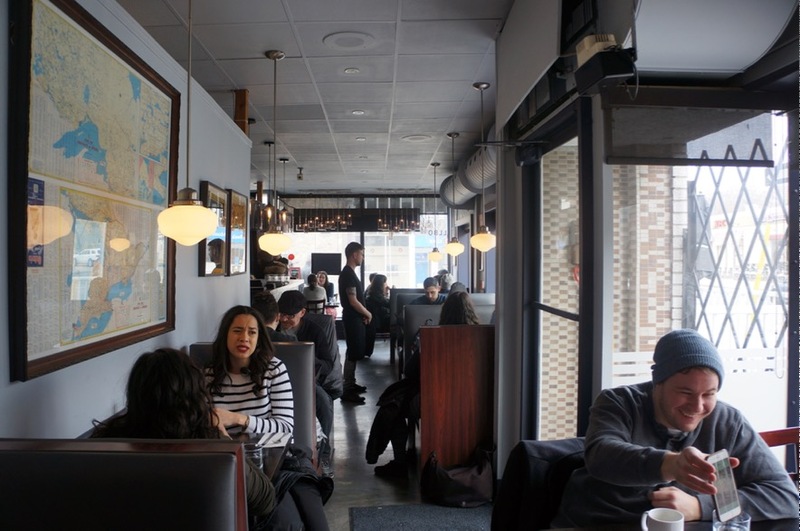 Overall, we had an enjoyable experience at White Brick Kitchen. While not everything knocked it out of the park, the food was certainly good enough to warrant another visit in the future!